I got this rear window wiper motor on eBay for less than $20 delivered. You could use it for a head turning prop and not have to bother with a mechanism to convert the usual 360° rotation into the back and forth rotation. I’m also going to try it as a lifter with the addition of a simple bar mechanism. The motor is 12V, but it will work from a 5V supply too, or you can use a PWM motor speed controller to dial in the exact speed you want. The motor’s positive wire and metal case are connected to the power supply. Connecting the other wire to the case (power negative) briefly starts a rotation cycle. If you keep the wire connected the rotation will be continuous. Once the wire is disconnected, the motor will stop at the next park position. 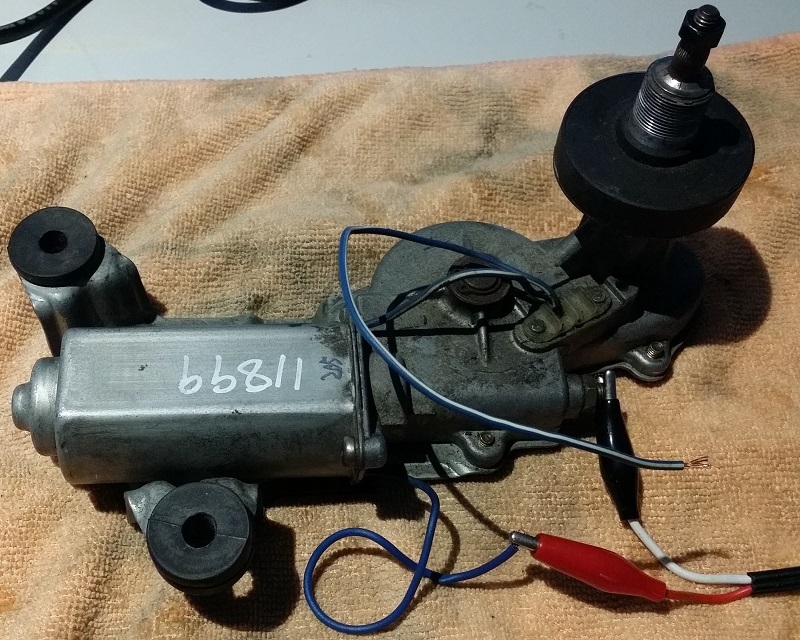 This motor was from a Ford Laser KJ/KL model and others may have different wiring.